THE advent of the digital age has changed the way most of us live and work - for some, to a much greater extent than for others. For the accountant, the role he plays and the way he operates have been altered considerably by technology in the last decade. The challenge for accountants, going forward, would be knowing how to build upon the skills that technology cannot replace and and figuring out how to ride on digital advancement to develop new skills. "A financial professional is no longer a bean counter or number cruncher," Lo Wei Min, a partner with local professional services firm Lo Hock Ling & Co, tells The Business Times. "This (traditional) function has been replaced by computers and management information systems in the digital age. With the aid of technology, even a non-accountant will be able to generate a simple set of financial statements or reports." This has meant a shift in the role accountants play in their organisation and the broader economy. As Philip Yuen, CEO of international professional services firm Deloitte Singapore and Singapore deputy divisional president of global professional accounting body CPA Australia, puts it: "The role of accountants has evolved significantly from just executing the traditional functions of accounting to being a strategic planner and a business adviser to the management team." He adds: "Accounting professionals must now enter the field as leaders with acumen and creativity to become active members in the decision-making process of the business; they are no longer seen as simply information gatherers for decision-makers." Sharing this point of view is Jean Lee, vice-president of finance, Asia-Pacific, at NICE Systems - a Nasdaq-listed, global leader of intent-based solutions that capture and analyse interactions and transactions. "Accountants in Singapore need to re-examine the roles that create value in business and develop skill sets that enable them to partner with the business. They need to innovate business processes for increased value. "Business acumen and business consulting skills are no longer an option but a must for accountants and auditors in Singapore who wish to continue being relevant," she says. In addition to a new skill set, accountants will also need to work at a much quicker pace - wrought by the new digital environment. Ms Lo says: "Timeliness of information is key to the work processes in the financial sector. 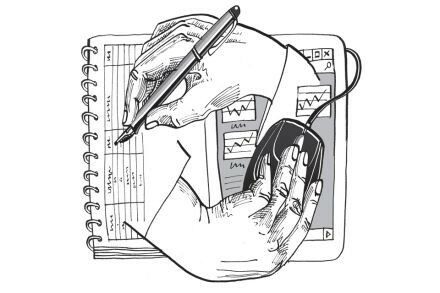 Accountants have learned to appreciate how sophisticated information systems, such as business analytics and data mining, can help them in their work." Mr Yuen adds: "Technology advances have enabled auditors to work more efficiently and made some aspects of the audit work less tedious. The use of analytics has allowed us to plough through large amounts of data and identify outliers more accurately and quickly, compared to the old days when auditors had to sample items and do things manually. It has also transformed the way auditors think from looking backward to looking forward - calculating and forecasting the future." Understanding how one's role has changed and the challenges put forth by technology will enable accountants to figure out how to recognise and take advantage of the opportunities offered by the digital age. Themin Suwardy, associate professor of accounting at the Singapore Management University and Singapore divisional president at CPA Australia, says there are two aspects to this. "Firstly, in relation to their usual work, accountants should look at how they can help improve or automate business processes by using technologies that would rebalance their work from routine operations to higher level strategic work. "This means looking at all the financial processes in the organisation, from payables and receivables management, to internal control processes and treasury, and seeing how they can be done better with the assistance of technology. Financial and management accountants alike should look at ways of how they can rise beyond just reporting numbers, by offering insights into the numbers so businesses can make better decisions." The second aspect has to do with accountants gaining a better understanding of how technology is affecting their organisations as a whole. "For example, how are you as an accountant adding value to internal discussions on cyber security, or how are you contributing to dialogues on data analytics on consumer purchase patterns? Have you played a role in the business's investments in social media? Accounting does not operate in a vacuum, so it is better for accountants to learn the context of business and technology and expand their roles to be 'business partners', rather than just being boxed in as record-keepers," Mr Suwardy says. Ms Lee adds: "Accountants are no longer focused on resolving issues on back-end accounting processes. There is an opportunity for accountants to propose solutions that are more strategic - looking at end-to-end process improvements that cut across various units and departments. Process improvements are no longer focused on processes, but are instead geared towards improving the customer's experience so that they are aligned with global best practices. "There is also greater transparency now with the help of technology. Key stakeholders are given close to real-time data to make timely decisions to support the growth and pace of business. Tools are also used to improve forecast accuracy, so that the right decision can be made in advance. "Accountants and finance professionals have the opportunity to leverage on the new tools in the digital age to respond faster and at lower costs, allowing resources to be distributed to other areas that yield significant topline returns to the business." Ms Lo points out that the greater transparency wrought by technology also extends to geographical borders. "Accountants and finance professionals will be able to find opportunities which may involve services or engagements beyond domestic boundaries. They should step out of their comfort zone to explore such opportunities." There are also the new types of work, and the increase in scope in the current type of work, available to accountants, thanks to technological advancement. Mr Yuen points out: "We have seen new niches emerging in the accounting profession such as forensic accounting and data scientists. "Another likely trend that we anticipate is continuous auditing. Though this concept has been around for many years, the advancement of technology could make this possible. Continuous auditing is designed to enable accountants to report on a subject matter within a much shorter timeframe than under the traditional model. In the traditional model, a period of time passes between the completion of fieldwork and issuance of the audit report. "In many instances, the impact of this delay makes the information contained in the report less useful or beneficial to businesses. Hence, the ability to provide auditing on real-time financial information through the use of technology will have a significant impact on the business performance, and the value of that information will be further enhanced when accompanied by an external audit opinion." The new opportunities offered by technological advancement do not, however, come without risks and teething problems. Ms Lee says: "Businesses need to tap into these opportunities by introducing the changes in phases for those who are already working, and by educating the potential accountants - who have not entered the workplace - of the emerging trends and opportunities that will impact their career path." Most interviewees said professionals, and continuous professional development programmes - such as those offered by CPA Australia - need to keep abreast of trends in digital advancement. They also say that more cross-border collaboration between accounting firms and professional bodies will be needed, so that knowledge of such advancements and multi-disciplinary skills can be shared. "Being a good accountant is like possessing an intellectual property - not only should we have knowledge, but it should also be relevant along with our experience and judgement," Ms Lo says. As for bracing oneself and the profession against the risks that come with the digital age, Mr Yuen says accountants and finance professionals need to have full, real-time awareness into events affecting IT ecosystems. "They should keep themselves abreast of the types of incidents that are occurring and threat trends across geographic and industry sectors that may have an impact on their clients. "Organisations in this industry are probably more vulnerable to cyber security incidents with the kind of corporate-related information that they possess such as pricing, asset portfolio, business strategy, secrets and legally protected information." Ms Lee says: "The best strategy is for accountants and finance professionals to firstly build a thorough understanding of the evolving risk of the cyber realm through education and communicating with key subject matter experts. Cyber security risks are managed similar to any other business risks and sound judgment regarding cyber security issues should be exercised. Risk education and communication to external and internal key stakeholder are vital to ensuring that all parties play their part to help to mitigate these risks."